A detailed map of Stellenbosch Town Centre with major landmarks and shops. 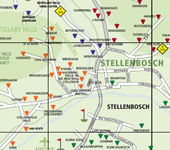 A full Stellenbosch town map with suburbs. A graphical map of the Stellenbosch Wine Route and Subroutes.